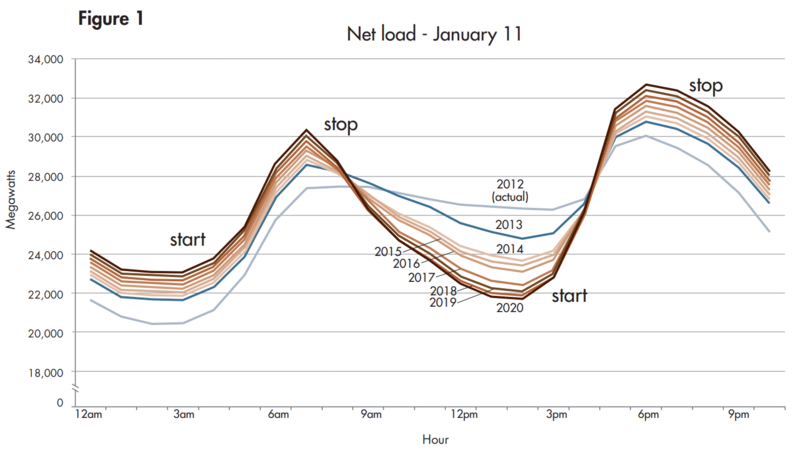 A phenomenon first observed in California around 2013, electricity supply-demand “duck curves” are emerging on grid systems elsewhere in the US. Utility grid customers across the New England region used more grid energy in the evening than they did during the daytime for the first time in history April 21, according to a local news report. 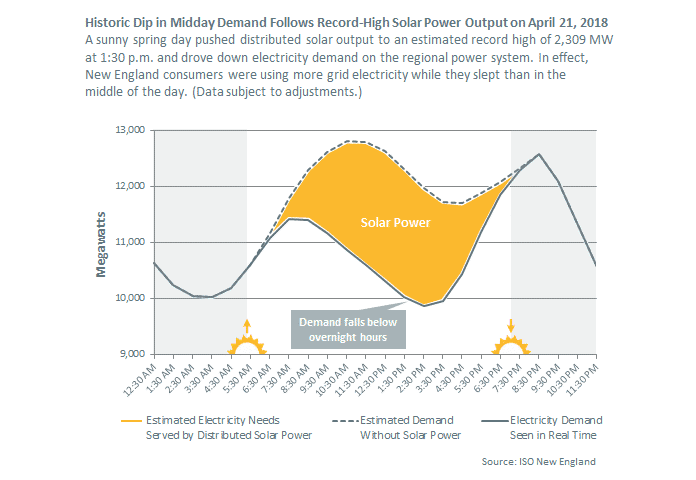 In other words, a grid energy duck curve has emerged in New England for the first time. Mild temperatures and “behind the meter” solar energy generation by utility customers were the primary agents that led to a historic record low in daytime grid demand, according to ISO New England, the independent systems operator (ISO) responsible for managing power markets, grid operations and grid energy resource planning across six US states. Needless to say, weather patterns and climate in California differ greatly from that experienced across the New England region. Nonetheless, regional grid operator ISO-New England said it expects the pattern will occur more frequently as “behind the meter” solar energy and other, variable, or intermittent, sources of emissions-free electricity generation, e.g. wind power, continues to rise across New England. Solar Magazine spoke with Paul Denholm, a principal energy analyst working as a member of the US National Renewable Energy Laboratory’s (NREL) Grid Systems Analysis Group, who, along with colleagues, developed new computer models that predicted that electricity grid duck curves could very well appear way back in 2008, long before anyone seriously considered that distributed solar power generation would grow to the degree that it would significantly impact entire power grids. 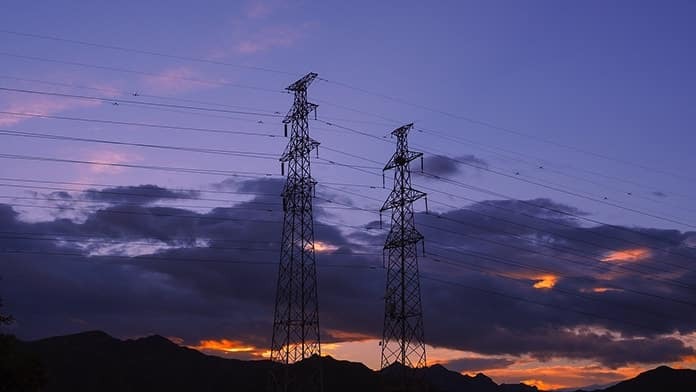 ISO New England is responsible for power markets and grid operations that extend across Connecticut, Maine, Massachusetts, New Hampshire, Rhode Island and Vermont. As is true everywhere, climate and geography strongly influence the nature and composition of electricity generation, transmission and distribution (T&D), and usage patterns across the region. Energy policy and regulations also serve as fundamental, determining factors, setting the goals and ground rules that govern sources and management of generation, power markets, consumer prices and grid operations. These vary widely across the US as, by and large, they are set at the state level. The result can be seen in the varying rates of growth and varying amounts of distributed, solar, wind and other renewable energy generation capacity installed across the nation. Massachusetts and Vermont have set the pace and emerged as leaders among New England states in terms of fostering investment in and deployment of distributed solar, wind and other emissions-free, renewable energy resources. Connecticut is doing similarly, though not as wholeheartedly. Legislators and regulators in Maine have been more reluctant. From a bird’s eye view, ISO New England hydroelectric, natural gas and nuclear power generation continue to meet the large bulk of regional electricity demand. In 2016, natural gas-fired power generation accounted for 49 percent of region-wide power generation and nuclear power 31 percent. About 17 percent of ISO New England’s annual energy needs are met by imports via inter-regional, interconnection agreements with Canada’s TransEnergie (Quebec), Canada’s New Brunswick System Operator and New York ISO. Looking forward, as of late 2017 ISO New England ISO-NE expected that ongoing growth in “behind-the-meter” solar generation and energy efficiency improvements would more than offset load growth over the next 10 years. California was the first US state to enact legislation and regulations, including setting hard targets, to reduce greenhouse gas emissions and spur deployment of the solar power generation, both in front of and behind the utility meter. It should come as no surprise then that the California Independent Systems Operator (CAISO) was the first regional grid operator to notice the emergence and begin to plan ahead for the duck curve. CAISO also coined the term, “the duck curve,” now in common use inside the industry and beyond. That was in 2013, five years after Denholm and colleagues at NREL first predicted they would occur. Looking back to 2013, “CAISO decided they needed to plan ahead and begin preparing, so they started running their own simulations based on the rapid growth [of solar-produced electricity on the grid],” Denholm recounted in an interview. 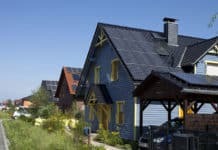 The distinguishing point is that the difference between evening and daytime grid electricity demand is widening, and that distributed energy generation, rooftop solar, for instance, is a primary driver, Denholm explained. Furthermore, California benefits from daytime solar peak demand reductions to a greater degree than New England, he continued. One reason is simply because Californians can produce a lot more solar PV energy than New Englanders due to the greater number of sunny days and solar energy resource potential in California. Consumer usage patterns also play an important role. 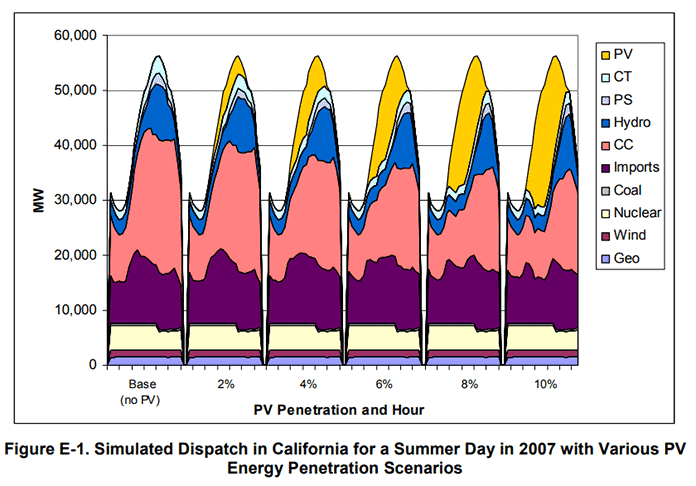 Southern Californians in particular use a lot of electricity in late summer afternoons, from around 4 PM to 6 PM, for instance, Denholm explained. “Southern California utilities experience particularly strong summer peaks in demand. 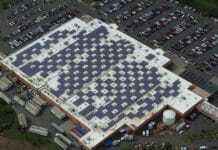 They can be very high between 4 PM and 6 PM on weekdays in August,” he told Solar Magazine. Distributed solar and renewable energy generation is prompting fundamental changes in power market prices and structures, as well as technology and infrastructure. The biggest thing consumers have to begin getting used to is that the flat-rate, volumetric prices we have become used to will shift towards time-of-use pricing models. 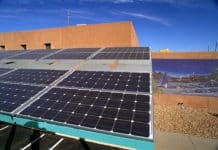 That trend is already in evidence in a growing number of US states – particularly those with large or fast growing amounts of distributed solar and renewable energy capacity – as regulators approve and utilities institute pricing based on the time of day electricity is consumed, as well as the quantify of electricity consumed. Emergence and uptake of an emerging panoply of smart, connected electrical and electronic equipment, appliances and devices also facilitates our ability to integrate and efficiently, reliably manage more in the way of solar and other variable renewable energy. Electric vehicle use may grow to have the biggest impact in that regard, Deholm continued. “It’s just not economic to plug your electric vehicle in for recharging the minute you get home from work. You can save a lot of money, and facilitate reductions in grid investments, if you simply wait until 10 or 11 PM,” he said. Furthermore, the ability of energy research analysts, grid operators and utilities to forecast weather conditions and predict their impacts across power grids is improving rapidly as well, Denholm noted. That bodes well when it comes to our ability to manage growing amounts of distributed solar and renewable power on the grid efficiently and effectively, thereby keeping costs down without compromising reliability and quality of service and reducing greenhouse gas emissions at the same time. Do we really need power grids? The emergence of grid energy duck curves is also indicative of the challenge, and threat, utilities face from rapid growth of distributed wind, solar and other variable, intermittent renewable energy resources. That’s led some industry experts to assert that a utility “death spiral” has begun. Does the appearance of grid duck curves portend that the day is approaching that power grids of the scale and scope extant today will be things of the past, that they won’t be needed? Digitization and “decarbonization” are driving power and energy systems in that direction. Denholm doesn’t think so. “I’m fairly ‘old school’ when it comes to that. If we lose the grid, we lose one of the main mechanisms for sharing electricity nearby and over long distances. Personally, I like the idea of being able to share, or buy, electricity from my neighbors, the community next door or from a wind farm in Wyoming,” he said.